The coins that resulted from the Act came to be known as Eagles due to their use of a repeating figure of the bald eagle, which, by Congressional Act must always appear on coins with face value greater than a dime. Initially there were three denominations of these coins: the gold eagle at $10, the half eagle at $5 and the quarter eagle at $2.50. 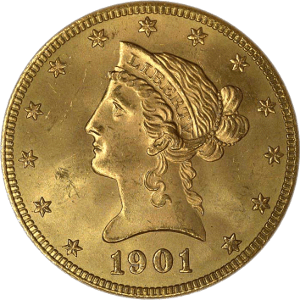 In the mid-19th Century, with the nation finding itself with an abundance of gold following the gold rushes in Carolina and California, Congress passed the Coinage Act of 1849, which instructed the U.S. Mint to create two more denominations of the series: the gold dollar and double eagle. As time wore on, these coins became known for the face of the woman that graced them, Lady Liberty, and thus the name Liberty Head gold coins. Today, investors refer to this set of coins as the Liberty Head or Coronet Head collection. The one dollar gold coin, designed by James Longacre in 1849, was the smallest coin in U.S. history, and was met with extreme consternation given its diminutive size versus its substantial buying power. Ultimately it was replaced with the Morgan Dollar, and since then, the only one dollar gold coin minted in the U.S. has been for commemorative purposes, reserved for presidents. The $5 half eagle had a long history of transformation with both obverse and reverse changing significantly over time. William Kneass is credited with finally putting the value on the reduced sized coin, indicated by “5D.” His Liberty head also had “E PLURIBUS UNUM” removed to further distinguish it from John Reich’s “Draped Bust” half eagle. Investors are most likely to encounter the designs of Christian Gobrecht. Gobrecht’s rendition of Liberty, with those two luxurious curls trailing down the nape of her neck, first appeared on the $10 eagle in 1838 and subsequently was placed on the $2.50 quarter eagle and $5 half eagle as well, then remaining practically unchanged for nearly 70 years.